Andrea Meger joined Newman Long Term Care in July of 2003 as the Licensing and Contracting Administrator. 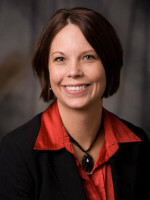 In July of 2005, Andrea became the Manager of Operations and Human Resources. Andrea brings to Newman Long Term Care a strong customer service and financial management background. She comes to us most recently from an operation management position with a local bank where she was responsible for the day to day operations of the branch. Andrea spends her leisure time with her friends, family and twin girls. Additionally she enjoys the outdoors, scrapbooking, sports and music.